FORTUNE PROVIDES QUESTIONS FOR THE GREAT ANSWERS: #4 A:	Go west, young man, go west! Q:	What do wabbits do when they get tiwed of wunning awound? This is a wheat flour and egg based homemade pasta, originally from the South-West of Germany (Swabia which used to be a Land of its own but now is part of Baden-Württemberg). 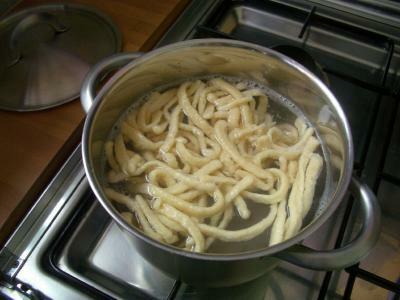 Spätzle are usually served with the Sunday roast. For all of your hunting for a spaetzle press - I now have a link to a UK supplier. You can find it here. Here are our ingredients (with the Spätzle press left of the salt shaker). 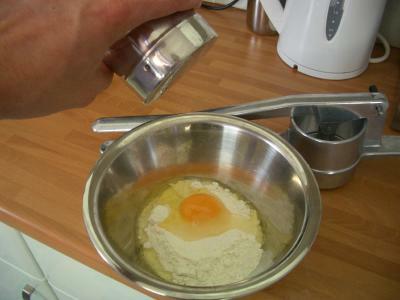 Add the egg and a pinch of salt to the flour. 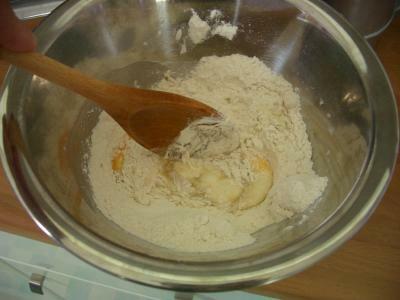 Mix with a wooden spoon until you have a smooth paste. Add some lukewarm water and stir again until the consistency is right. 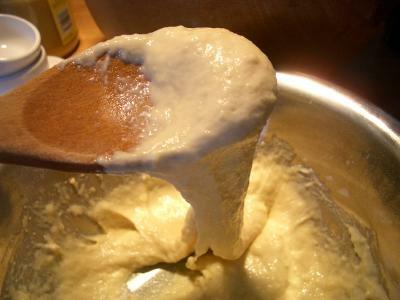 This is what the dough should look like when you have reached the right consistency. 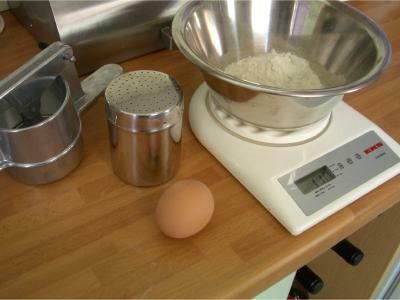 If you have added too much water, you can balance that out by adding a bit more flour. I tend to let the dough set for about half an hour before proceeding. Bring lots of water with a pinch of salt added to a boil. 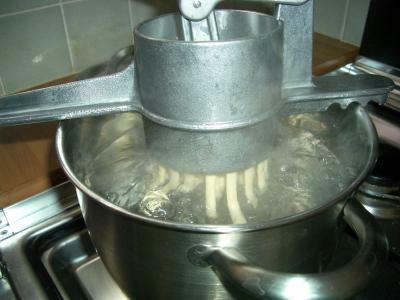 Now place the Spätzle press over the saucepan and put one portion at a time into the press. Press the handle down. 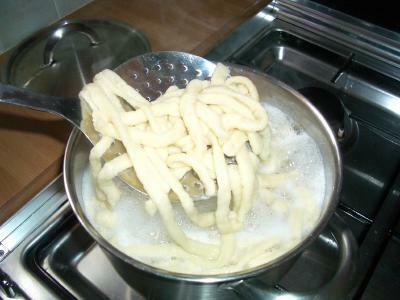 When you are at the end of its course, cut off the hanging Spätzle with a knife or a spatula. 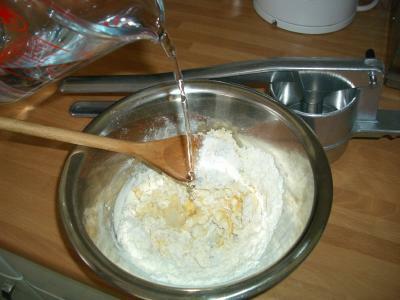 Traditionally, bits of dough are put on a wooden board and scraped into the boiling water using the back of a knife ... I've done that before, but it is very time consuming and also requires a fair amount of practice - so best use a Spätzle press as shown here. Your hob should be on full power. 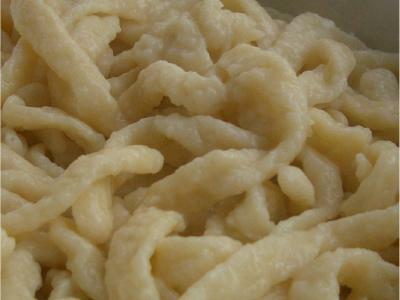 After about 30 seconds, the Spätzle will start to surface. When they have all surfaced, take them out trying to drain off as much of the water as possible. Make sure you have taken them all out, bring the water back to a boil and process the next batch. Put them in a dish and add a knob of butter if you like. 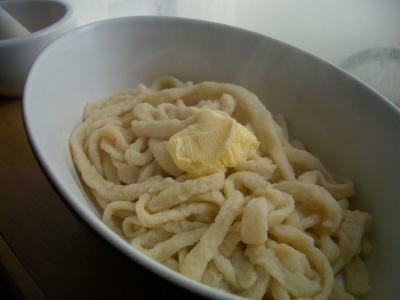 Mix the melted butter into the Spätzle and serve. Alternatively, you can put the buttered Spätzle into the oven at 200 degrees centigrade / 400 Fahrenheit / Gas Mark 6 for 15 to 20 minutes and then serve. 9 A coking show on the BBC (Rick Stein? Or the Hairy Bikers? Can't remember) demonstrated that you don't need an expensive spaetzle press: you pour the mix into a sieve, hold it over the boiling water, and as the stuff oozes through, scrape the oozing strands off with a knife into the boil. Voila, spatzlen. 10 Great pictures depicting each step and ability to have recipe adjusted for the amount of servings. Love it, thank you! 10 My Oma always made them with milk instead of water. What would be the difference? 10 Love the way it is set up. Very easy too follow. Would love too get my hands on one of those handy machines. 10 thank you, this tastes just like home when I add browned bread crumbs and put lettuce with cream and vinegar over it. love it. 10 I've been looking for this , My grandmother use to make this on Sunday's , I love this dish and am going to try it myself, thanks again!! 10 Nicely arranged with recipe at the top. Helpful photos. 10 So one egg, or four eggs? The ingredient list shows 4 eggs, but in the picture and directions it lists 1 egg? 7 YOU DO NOT USE LUKE WARM WATER - C O L D WATER -I SHOULD KNOW - I COME FROM STUTTGART - US HANDMIXER WITH HOOKS. 10 I MISS OLD WORLD COOKING. 10 Great. My grandfather used to make this when I was little. He made his own pasta, all by hand. Brings back memories. I like to add course black pepper to the mix. 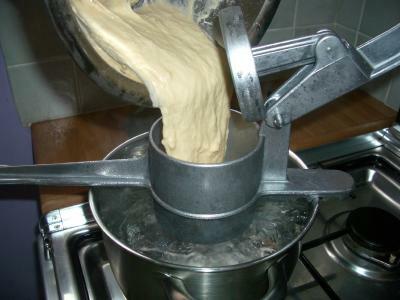 9 If you don't have access to a press, use an ordinary kitchen colander and push the dough through the holes with the back of a ladle. 10 Real easy to make and taste great lightly fried. 10 This is the way I make them but pour browned butter on them before serving. 6 Need measurements in cups and Tbls. 10 10! With browned onions, grated cheese and a good amount of butter you will have Kaesespatzen. 9 will go well with my pork roast.thanks.GOD BLESS! 10 Mein Gott...thank you! This is great because you can go between imperial and metric measurements easily. Good step by step picts but without a press or collendar that would work you might want to mention the traditional way of a cutting board and back side of knife. Also, if you could describe the consistency of the dough would be very helpful. Danke! 5 Where is the cheese mentioned? i use sauted onions in butter and swiss grated cheese @ layer alternstely but put onions on top & use dumpling shaped spaetzel. 10 Spaetzle is the BOMB!!! From Tserna jacksonville florida. 10 Das isst sehr goot. 7 I ordered roluaden and spaetzle at a German restaurant last month, and I wanted to love it, but I just couldn't. I don't think the innards were as generous as yours, and I had to add mustard after it was already served. I'm sure homemade is way better, as it usually is. And I so get that feeling when a familiar fragrance from childhood meals fills your house. I love that I'll be able to bring those smells to my own house and family one day. :) Awesome post! 10 oh my goodness. have just seen this being made on the tv .never heard of it . struggled to find it.the person making it was german and I couldn't quite understand him .this site is wonderful as it is so easy to see and understand .I will print this off for my 15 year old grandson who is going to catering school when he leaves school .he loves pasta . just bought the plate with the holes in to push it through . thank you so much . cant wait to try this . from Florence in Liverpool England. 10 Das ist immer so Gut!